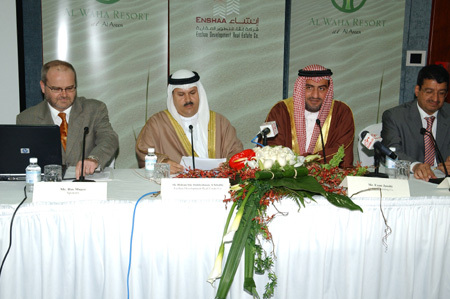 In a strategic initiative aimed at energizing investments in Bahrain’s tourism infrastructure and enhancing its appeal as the region’s leading leisure destination, Enshaa Development Real Estate Company today announced the launch of Al Waha Resort within the greater grounds of the Al Areen development. Located in close proximity to `The Lost Paradise of Dilmun’ Water Park, the Al Waha Resort is designed to blend business and upscale living. The master plan model and design of Al Waha Resort, comprising a luxury hotel, executive serviced apartments and condominiums, was unveiled during a special ceremony at the Al Areen Client Relations Center today. Al Waha Resort is barely 10 minutes away from the Riffa Golf Club, half an hour from Bahrain International Airport and close to the Bahrain International Circuit. It is adjacent to a huge shopping mall. With direct access to all Al Areen offerings, which offers upmarket retail units, restaurants, cafes, recreation and sports facilities in the northeastern end of Al Areen. Sheikh Hisham bin Abdulrahman Al Khalifa also introduced that Al Waha Resort had been designed by the Australian-based architectural firm, Spowers. Besides lending a new dimension and diversity to lifestyle at Al Areen, Al Waha Resort adds tremendous value to the portfolios of property investors. Al Waha Resort will be a mixed-use development, which will house a luxury hotel consisting of 206 rooms in addition to swimming pools, restaurants, a health center and spa, a business center and a huge ballroom with a capacity for 700 persons. In addition to the hotel, the resort will contain 110 Serviced Apartments of one, two and three bedrooms with all the amenities and facilities required for visiting families. The resort will also contain a residential area of seven buildings comprising apartments for sale, with all the services required for the complete comfort and enjoyment of its residents. Al Waha Resort is being developed in the northeastern end of Al Areen, which renders easy access to a multitude of entertainment areas, restaurants, cafés and up-market retail stores around Al Areen’s downtown boulevard. Located in an area of upscale homes and villas, the resort has been planned with growing families in mind and is ideal for young, upwardly mobile executives. “Al Areen Holding Company, in association with Enshaa Development Real Estate Company is extremely pleased to launch the Al Waha Resort at the Al Areen development. The Al Waha Resort is made up of an artful mix of recreational, residential and commercial offerings that will add tremendous value to Bahrain’s tourism and real estate sectors. It is in sync with the overall strategy and design of the Al Areen development,” added Mr. Janahi. The Al Areen development is a multiple-concept project actively endorsed and supported by the Government of Bahrain, which is a stakeholder in the project’s holding company. Recent progress at the Al Areen development featured the launch of Domina Hotel Al Areen, a resort hotel engulfing “The Lost Paradise of Dilmun” Water Park, and the near completion of the much anticipated Banyan Tree Desert Spa & Resort, the first luxury resort of its kind in the Kingdom of Bahrain. The project will boost the image of the Kingdom of Bahrain as a preferred destination for family tourism as well as add value to the government’s policy to enhance the contribution of tourism to the national GDP.